Dr.Malpani's Blog: Don’t let IVF treatment stress you out ! Growing scientific research has revealed the physiology behind mind-body connections as well as the impact stress has on fertility and overall wellness. Regardless of how much of research you conduct about IVF and get counseled for it before actually starting on the treatment, you may find it difficult to handle the levels of stress you go through at different phases of the IVF cycle. We see a lot of patients who are frazzled and completely out of sorts while they are going through their IVF treatment; this despite the fact that they have been extensively counseled about the process and have complete information about the treatment and its limitations. The good news is that it’s possible for you to actively alter the way your body responds to stress. It’s possible to learn how to handle stress better and you can learn to calm your system , so you can cope better with the stress of IVF treatment. Using mind body techniques can very effectively help address the effects that stress has on you. Whether this stress that you feel is the anxiety related to your scheduled IVF treatment, the 2WW or even emotions such as hopelessness, sadness or jealousy, these techniques will help you re-balance your system on an emotional as well as physiological level. When you regularly practice yoga and meditation, your body is able to rapidly move into a state of deep relaxation; and once this particular pathway to calm and relaxation has been cultivated, automatically, your brain is also able to improve its ability to calm-down in times of stress. You will find that you are able to draw upon your own calming systems when you need to feel comforted and soothed. There are a range of mind-body techniques you can use; you just have to find one which resonates with you. For people who have type A personalities, meditation can be a somewhat difficult task; and yoga or mindful walking may be a much better option. Deep breathing, relaxation response, vipassana, visualization and guided imagery are just some of the other mind-body techniques you can use to calm down your stress cycle & rebalance your system. Find a good practitioner whom you trust, and learn a few mind body techniques; these will help you through the stresses and worries of IVF treatment. And don't forget that there are lots of useful simple practical hacks you can use to cope with managing the nitty-gritty of the IVF cycle. Scheduling clinic appointments, waiting for the scans, doing the blood tests and organising the rest of your life can seem overwhelming, and this can add to your stress levels. 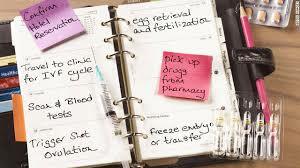 The free MyFertilityDiary app can help you regain control of your life, so you can organise yourself more efficiently.